When I lived back in the States, I used to have sushi all the time. I still love it, but I find to get proper sushi in London, you usually end up paying an arm and a leg. 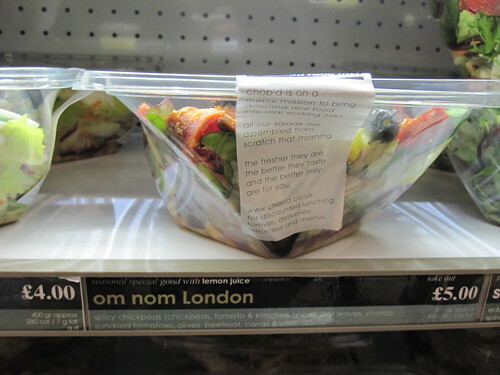 If I’m every really craving it, I might have Itsu for lunch, but even then, I end up spending £7 or £8 for something that’s not really high quality. So, essentially, I’ve been avoiding sushi as much as I can. There’s a part of me that doesn’t want to find a place I like because I know it will be expensive, and I know I’ll just want to go all the time. Tajima-Tei is a perfect example. I went here on a very cold and rainy London evening. My dining partner had said that he heard about it from a friend who said it’s the only place he goes for sushi in London, and that it’s the only place Japanese people in London go for sushi. Walking in, that seemed to be a true statement. I think we were the only native-English speakers in the whole place. Good sign. The first thing I order at any sushi restaurant is hamachi. Ninety-nine percent of the time, you can judge the quality of a sushi place based on the quality of their hamachi. For example, what did I think of Hakuba‘s hamachi? Not great. Tomoe‘s hamachi? Actually quite nice, and a good price. Japan Centre‘s hamachi? Meh. And that pretty much sums up my feelings of all of those restaurants in general. Lovely, rich and buttery. A fantastic fish. I really liked this place. It’s a bit out of my way, which is probably a good thing as I won’t be tempted to come back too often, and it’s not the cheapest (food and two carafes of sake and service was about £65), but it was definitely tasty. I had my first taste of Asia de Cuba, the most well-known (only?) 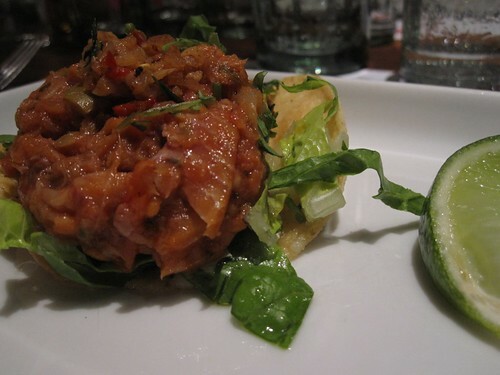 tropical-Asian fusion restaurant in London and New York, at Taste of London, and I’ve been dreaming of it ever since. After one failed attempt at lunch in August, I was ready for another go – especially since they had a 2-course £15 deal going on for London Restaurant Festival. The restaurant is located in the St Martins Lane Hotel. It’s about as well-hidden as you can get being on a busy street in tourist London. The only hint of an address number is a nearly transparent sticker at the bottom corner of the giant chiffoned window that faces the street. I walked up and down the street about three times before I figured it out. The other thing about Asia de Cuba is that it’s expensive. And by expensive, I mean overpriced. But that does not mean it’s not fantastic – it just means I’m not normally going to go unless A) it’s a special deal B) it’s a special occasion or C) someone else is paying. My lunch obviously fell under Category A.
I started out with the beef dumplings two ways: crispy with plum sauce and steamed with coconut rice and mango ponzu. Gorgeous presentation. A bit small on the portion, but it is only a starter. The crispy dumpling was, indeed, crispy. There was far too little plum sauce though. After one swipe it was pretty much gone and I was left with a dry dumpling. The steamed morsel was much more my taste, but unless I’m blind, it didn’t come with any coconut rice. That was a bummer. For my main, I got exactly what I tried at Taste of London – the dish I’ve been dreaming about for four months: Honey-rhum glazed pot roast of pork. The top of the roast is crispy with caramelised goodness. Underneath that, there is a nice pork belly-esque layer of fat, followed by the most supple melt-in-your-mouth pork roast ever. The dish is served on top of cubed fried plantains (gotta get the tropical theme in there somewhere), enoki mushrooms and bok choi. This is seriously one of my most favourite dishes on the planet. It is an absolute explosion of contrasting and complementing flavours all at the same time. I can not put into words how much I love this. It was just as good as I remembered, and I will have a hard time ever ordering anything else off the menu. The only problem with this dish is that it is monstrous. I was conflicted… it was so good I wanted to finish every last bite, but I found myself slipping into food coma after about 25 minutes of om nom nom’ing and had to stop. In hindsight, I’m glad I did. I don’t think I could even look at food for the rest of the day. Dessert was not an option, but I think at some point in the near future, I could be tempted with the mini mexican donuts filled with butterscotch sauce. The others I thought looked very nice as well. Service was fine, but nothing to write home about. I didn’t find anyone to be particularly personable, but I can’t complain since the service was prompt and the meal timed correctly. There are definitely a lot of reasons people gripe about this restaurant (value for money being number 1), but as far as I’m concerned, they’re crazy – I’d probably pay double just to have that pork over and over again. This tiny Venetian tapas restaurant in the middle of Soho has really made quite a splash since it opened earlier this month. Harnessing the power of social media, Polpo‘s owners have managed to drill down into the heart of the London foodie community and probably get more food blogger reviews in a few weeks than other restaurants have in years. Now, whether that’s a good strategy for a new restaurant remains to be seen – the reviews from what I can tell are a mixed bag. My experience, however, was definitely a positive one. I managed to snag a table for 3 for a 2pm lunch. The restaurant is still hopping. We sit down and take a look at the menu. I have a momentary freakout because I’m with one vegetarian and one sort of vegetarian, and at first glance it doesn’t seem like there’s much on the menu for them to eat. A bit of detective work, however, found veggie dishes popping out from other categories. The croquettes are lovely, as is the salt cod. I’m not too much a fan of the crostini. The tapenade had a weird rubbery texture I couldn’t quite get used to. This was fantastic. There was a nice bit of bread crumbs on top to give it a bit of a crunch. The zucchini itself had a nice bite to it as well (seems they were generous with the lemon). I always think zucchini has the potential to come out very soggy depending on how its cooked, but this was done perfectly. OMG. This was soo good. Very simple, elegant blend of savoury flavours. The cheese was a sharp balance to the warm pumpkin. I’m making this at home. Easy, super fantastic dish. This white pizza was a blend of cheeses with some very sweet roasted onions. It was a good size portion. I would order it again. So far, I’m a fan of Polpo. I’d definitely like to give it another go some time, particularly to try some of the other meat dishes – especially because I was so fond of the pumpkin ham. It will be interesting to see if it stands the test of time now that all the blog buzz is starting to die down. Finally went to get my salad! w00t! No one actually wants to eat frozen yoghurt. I mean, the whole point of frozen yoghurt is that it’s supposed to trick your mind into thinking you’re eating ice cream when you’re in fact eating something slightly healthier. The Americans have perfected this. The fro-yo there (for whatever chemicals they put in, I don’t care) tastes like frickin’ ice cream. It’s brilliant. Here? Not so much. No matter how you many Oreos you dress it up in, British frozen yoghurt tastes like someone put my Activia in a blender with ice. 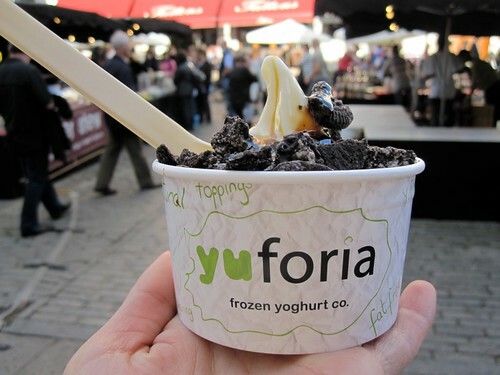 Perhaps now that my Mexican food quest is over, I should concentrate on finding good frozen yoghurt? Stef’s is located pretty much on the cusp of the first circle of Hell (just north of Oxford Street across from the Plaza Shopping Centre and next door to a Nando’s), but that won’t stop me from going there again. We had a large group on a Saturday night and were all there on a Top Table deal of 2 course and a glass of prosecco for £15.95. Now, most of the time on these deals, I expect to be treated pretty poorly, but the staff at Stef’s couldn’t have been sweeter. The ‘deal’ menu had a lot of choice, we weren’t rushed by the staff at all and I thought the food was excellent (plus, all 7 meals came at the same time – something that seems to be a huge challenge for far too many restaurants these days). 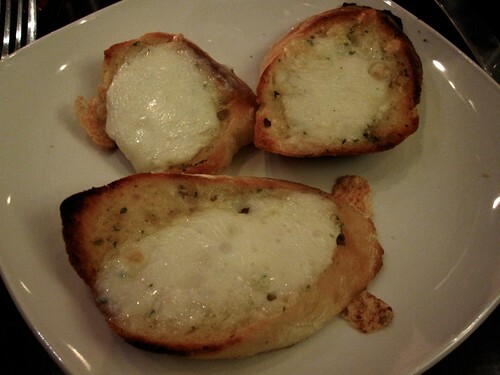 For my starter, I went with a very simple mozzarella and garlic bread. For my main, I had chosen a tomato cream tortelloni, but unfortunately they had just run out. It must have been pretty popular. 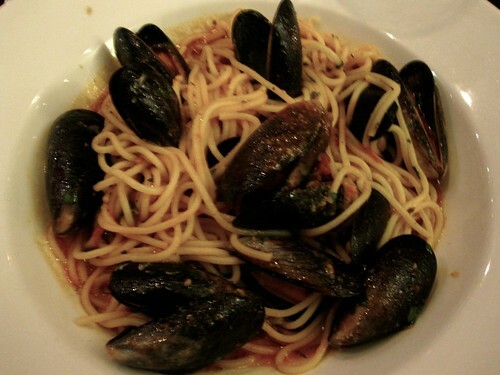 I asked for a recommendation, and ended up going with a spaghetti with mussels in a spicy tomato sauce. It’s so easy to get used to banging on about crazy intricate sauces and complex flavours that you often forget that simple can be best. This was a nice al dente pasta with tomatoes and chili and garlic and spices. Nothing complicated, but certainly very good. 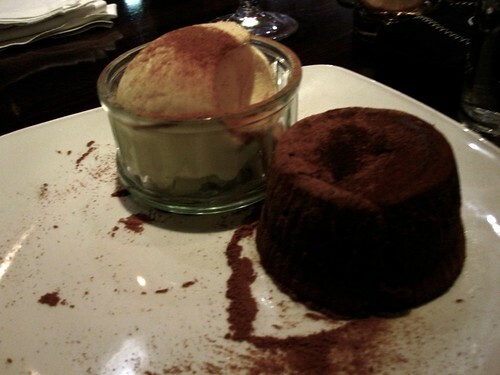 I was one of the few tempted by dessert, and went with this chocolate souffle cake. I was amazed (and a bit bemused) as to how this cake got to our table so quickly. Usually with a souffle it takes a little bit of time to cook – especially to the point where the middle of the cake is nice and oozy. I ordered this and within minutes it was sitting in front of me. It’s a mystery – a very delicious mystery I probably don’t want to know the answer to. Definitely pop into Stef’s if Oxford Street Christmas shopping is doing your head in. It’s not quite as good as Amaretto, but still a cheap option for yummy Italian in Central London. Most Americans in London feel they are on personal quest to find good Mexican in the UK. Get a bunch of us in a room together and we’ll inevitably start talking about the burritos here or the enchiladas there – but the consensus is pretty much always that it’s never as good as home. Well, friends, the quest is over. I give you, Wahaca. I was invited to the Westfield location of Wahaca along with about 20 other Qypers to sample a few new items from the winter menu. What I didn’t realise is that we would be sampling EVERYTHING. Seriously, like 11 dishes. It was amazing. Co-owners Mark Selby and former Masterchef winner Thomasina ‘Tommi’ Miers were there to welcome us warmly and explain a bit about the ethos of the restaurant. They offer affordable (read: super cheap) and authentic Mexican streetfood designed for a British audience – and I think that’s the reason Wahaca succeeds where so many others have failed. 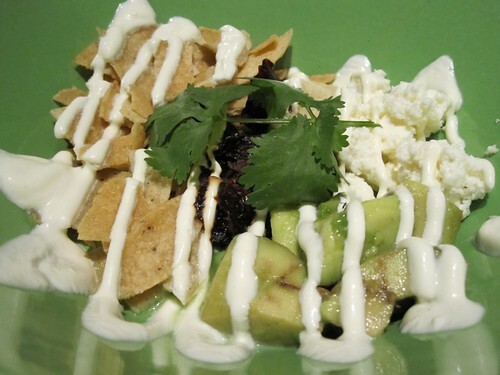 It doesn’t try to imitate other popular Mexican restaurants. It has its own style. Since 11 dishes is quite a lot to write about, I’m going to condense this to highlights. Perfect example of the whole Mexican food for an English palette. A lovely chilled fish with fresh lime and spice served over a tortilla with olives and capers. Great little starter. 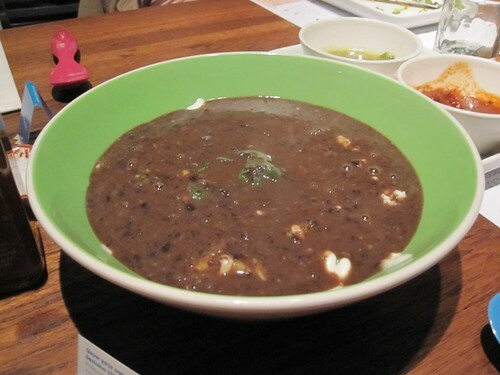 The result was a lush black bean soup with little surprises of fresh avocado, chicken and cheese. Yum! I’m not usually a superfan of mole. It’s too thick, too heavy and just generally makes me feel a bit blah. This you could have poured into a bag and fed me intravenously. It was the most scrumdiddlyumptious dish I’ve had in a long while. 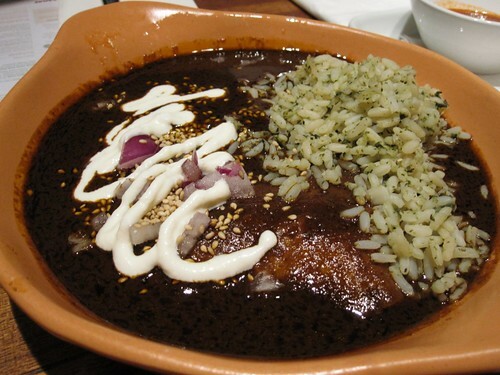 Served, enchilada-style with rice and shredded chicken. I think I just made squeaks when I ate this. Words could not fully form in my mouth, that’s how yummy. 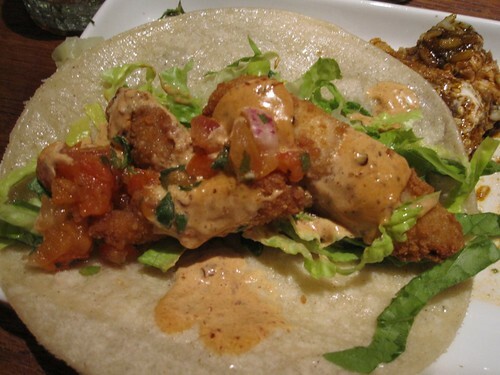 Each taco comes with a delicately flash-fried piece of plaice with chipotle mayo, salsa, beans and spicy slaw. I think by the time these found their way to our table, we were about 8 or 9 dishes in. I was SO FULL, but honestly still wanted to eat the whole plate. Delicious! 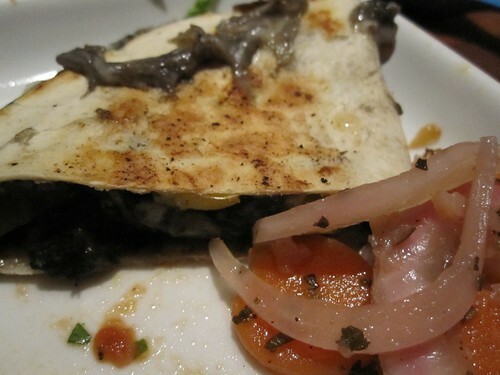 This is a quesadilla of what is basically the fungus that grows on corn (though it’s described on the menu as ‘Mexican Corn Mushroom’ lolz). I’m not generally a fan of mushrooms, but this was actually quite nice. The pickled veggies on the side were ace – a really nice way to balance out what is a pretty rich little number. This was probably my least favourite of the night. There was just too much going on – all the tastes became a bit muddled. 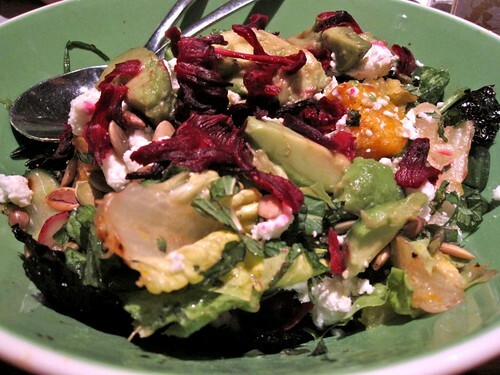 Included was butternut squash, organic spelt, diced orange, ancho chilli, feta avocado,pickeld hibiscus flowers, fresh mint, pumpkin seeds, salad leaves, totopos and radish in house dressing. Yikes. All that and it still needed a bit of sweetness. 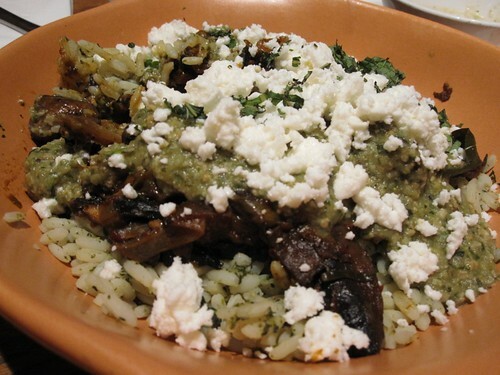 A carbtastic overload of mushrooms, crumbled cheese and rice. The tomatillo salsa was amazingly fresh, but for me this wasn’t a stand-out dish. Many of the ingredients were things that we had tried before in one dish or another, so for me it was a bit ‘been there, done that’. 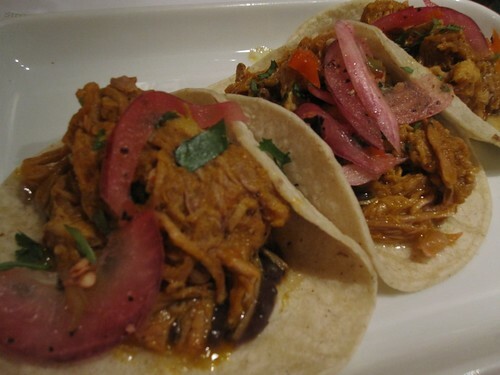 Three lovely little pork tacos served with some nice pickled onions. 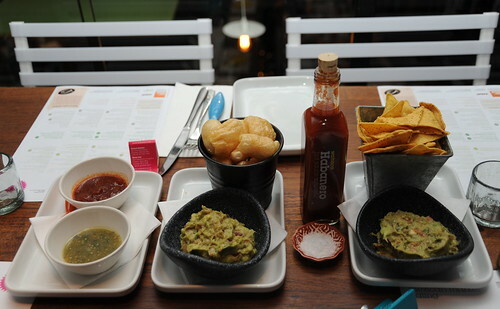 This is what Wahaca means by ‘streetfood’. Not overcomplicated, just good spicy pork you have to eat with your hands. Never met a piece of fried cinnamon-sugar dough dipped in chocolate that I didn’t like. 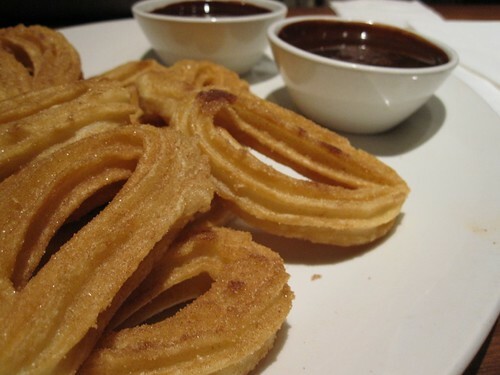 Wahaca’s churros are no exception. The Americans at the table joked with Mark that we couldn’t believe they didn’t have fried ice cream on the menu like ChiChi’s. What a sham! Congrats if you’ve made it to the end. I’m sorry I didn’t review everything, but it seriously would have been a novel. Trust me though, it was all amazing. Do yourself a favour and try it out. 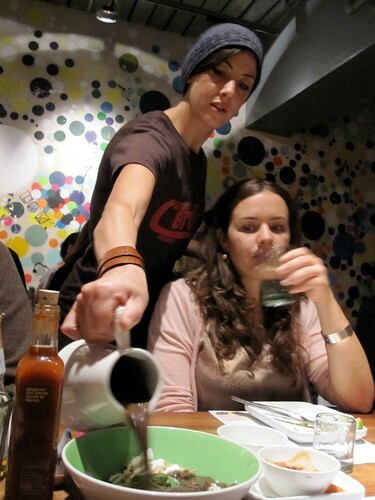 There are Wahaca locations in Covent Garden and Westfield, with one opening in Canary Wharf in November 2009. I’m going to point out – because apparently it’s quite the bone of contention with foodies and reviewers online – that they do not take reservations or bookings, even for large parties. Even if you have to wait though, it’s worth it. If you want to see the pictures of the other things we enjoyed, check out my Flickr set from the night.